Solid Rock Realty is heavily involved in the real estate community of Colorado Springs and its surrounding areas. We assist Sellers, Buyers, and Landlords through their real estate transactions and their investments, providing clients with the professional guidance we feel they deserve. As Colorado Springs Realtors, we are committed to our clients and will do what it takes to meet their needs and help them achieve their dreams. We go the extra mile for Sellers who choose Solid Rock Realty. We provide constant communication, tend to questions and concerns, as well as make ourselves readily available. We create detailed Comparative Market Analyses, helping sellers find confidence in their listing price. We hire professional photographers and create unparalleled 3D Matterport Virtual Tours, ensuring the property has a strong presence on the internet and on the market. Your listing will be in multiple Colorado MLS's, hundreds of online websites, utilize Smart Yard Signs, and create property specific Buyer Guides. We also provide Home Staging Services with our in-house staging and if you're moving across the front range, you'll have access to our 32 foot box trailer picked up and dropped off for your convenience. If you need to sell your Colorado Springs home as-is and in less than 3 weeks, we can put together an all cash offer in less than 24 hours, free of charge. We promise to do our absolute best and make our Sellers' needs a top priority no matter the situation. When Buyers choose Solid Rock Realty, the premier Colorado Springs Realtor, they can expect incredible service. We do all that we can to ensure our Buyers get in to see homes of their choosing in a timely manner. If our Buyer is not a local resident, it is not a problem. Based on casual conversations, we can perform customized searches, finding numerous homes that meet our Buyer’s needs; we can provide video walk-throughs of homes they would like to see. In addition, we are happy to connect our Buyer's with inspectors, contractors, vendors, or whomever else they may need. We make sure all of our buyers are confident and taken care of heading into their new home or investment purchase. Solid Rock Realty does not stop there. 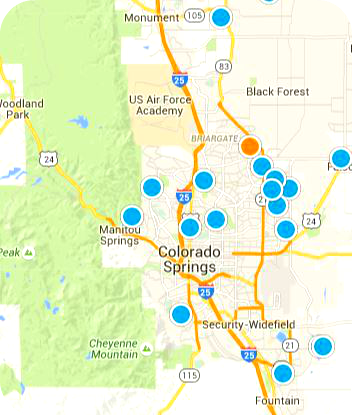 Property Management is just as much of our Colorado Springs Realtor business. We provide our Landlords with unbeatable service from marketing their rentals, placing tenants, maintenance, scheduling contractors, routine inspections, and taking care of your Tenants. We have no hidden fees, no markup charges, and no long term contracts or commitments. Our rates are simple and straight forward; our fees are setup to align our goals with our Landlords'. Not only do we take care of our Landlord's, but we make sure our Tenants are heard too. Our Colorado Spring Realtor business was founded on Matthew 7:24-25: "Therefore everyone who hears these words of mine and puts them into practice is like a wise man who built his house on the rock. The rain came down, the streams rose, and the winds blew and beat against that house; yet it did not fall, because it had its foundation on the rock." The Solid Rock Realty foundation is the Bible, and we strive to conduct business and live our lives in a manner that aligns with that foundation. Listing courtesy of Around The Block Realty.